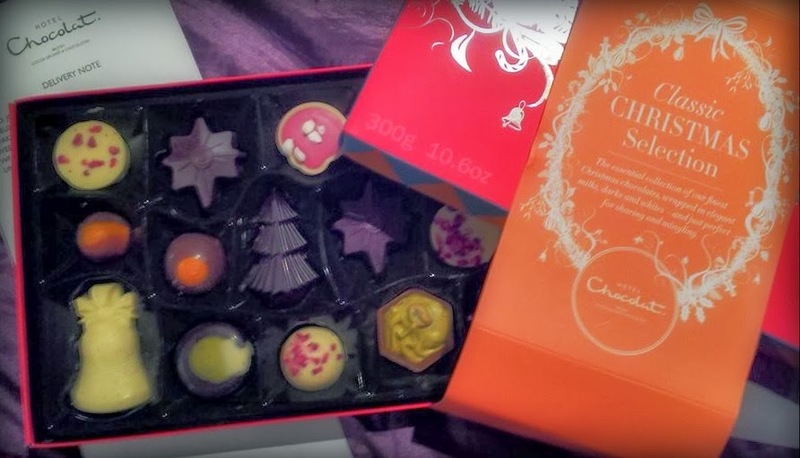 We have been asked to review a box of chocolates, a box of Hotel Chocolat's Sleekster Classic Christmas Selection chocolates. This has caused great happiness and consternation within the house of the Quirky Kook, to be honest. TeenTwin2 was happy because she has a "twitter-relationship" with someone who works in one of Hotel Chocolat's chocolate emporiums in somewhere and was on telly once. She tweeted about the programme, he favourited it, she favourited him back, or whatever, and now she can taste some of what he's selling. Everybody else was happy there was chocolates and that I wanted them to eat the chocolates. That doesn't happen often, my relationship with chocolate having been frankly soured by years of continual chocolate-based disappointment (The Galaxy Counter was NEVER that small and don't mention Creme Eggs *tuts*). I don't, if asked, say I eat chocolate, though sometimes I do because I'm a woman and it's the law or hormones or something. But when I do eat chocolate, I am always disappointed. Chocolate, I think sadly, is not what it used to be and then hanker back, nostalgically, to the days when chocolate was chocolate, thick, creamy, rich and an explosion of, well, chocolate. I was probably seven years old. TeenTwin1 liked them. She was astonished at the existence of chocolate that didn't, well, clag your mouth up. (What? We're from Yorkshire) She was going to have another but restrained herself politely. TeenTwin2 liked them so much, she kept quiet and snuck an extra chocolate instead. *tuts* ...........No-one dare tell TeenTwin1 and now we live in constant fear she may find out. The Tween liked them too. There was hopping and skipping, smiling and even a little bit of jumping. The next time I want to lure the Tween away from Minecraft, I will be employing a Hotel Chocolate Cranberry Cup, and that's for sure. Disclosure: We were (very happily) provided with a box of Hotel Chocolat's Sleekster Classic Christmas Selection for review. All opinions, words, photos and chocolate smeared mouths are our own.